Give away elegant bookmarks with a touch of luxurious foil. Create useful giveaways for customers at your book launch or big sale. Foil bookmark printing creates luxurious foil accents in six opulent hues. The hot foil stamping process decorates images, text, and other details in a smooth surface. Choose from six foil colors: gold, silver, copper, black, blue, or red enhancements. 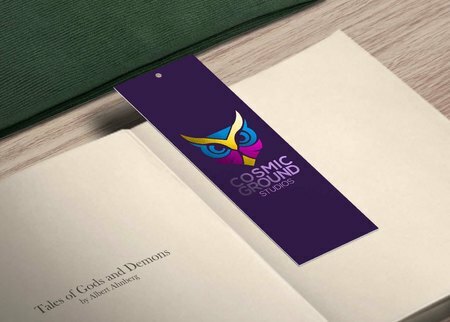 Foil printing is applicable on one or both sides of your personalized bookmark. Silk lamination coats the entire design to complement the vibrant colors.. The 16 pt. cardstock adds to the premium impression you’re bound to make. Spot UV printing varies the texture on a plain surface. It adds a vibrant, high gloss shine to decorative elements or words that need emphasis. Your file should be in any of the four available standard sizes. The 6” x 2” is the biggest and most popular option. All orders come with a 1/8" hole in the top center. Strings or tassels are not included. Download the layout templates below for your bookmark dimensions. It will help you verify that your artwork meets all of our guidelines. This means checking if your text fits inside the safe zone and your design bleeds to the paper’s edge. Follow the specifications provided so you can be sure your artwork prints correctly. You can download PDF, EPS, JPG, and Publisher versions of each layout template. Personalize every detail. Whether you’re printing a set for your church or as giveaways at a wedding, the bookmark’s text, images, and overall design should be customized to its purpose. Give them away at big events. Give away foil bookmarks to the university’s prospective freshmen or at a big book sale your publishing company is participating in. Make it easy to read and worth keeping. Use the foil accents to highlight a particular design or to emphasize a memorable line that customers will refer to.